In Ryte Website Success, you can check any single page in real time. Various OnPage factors are taken into account. These aspects concern both the content and the technical apsects of the analyzed URL. In this article we will show you how to proceed with a single page audit with Ryte. Ranking losses: A single page analysis can be compared with a check-up by a doctor. The symptom is a loss in ranking, and doing an in-depth audit will help you find out the cause. Relaunch of a website: During a relaunch it is always possible that important elements of a website might be damaged in some way meaning that central OnPage factors are not sufficiently optimized. A single page audit can therefore be carried out here as a preventive measure. 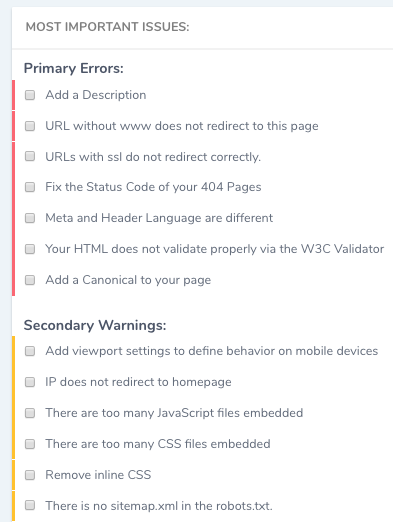 Restructuring of a URL: An audit is also useful if you have restructured individual page areas, for example when checking for errors after adjusting the source code. Short analysis to derive SEO measures: A single page audit is a very effective way of getting a first impression of a website. The results of the analysis can be used, for example, to derive clearly necessary measures and to demonstrate their urgency transparently for customers. Serious errors such as incorrect redirects, missing alt attributes for images or missing headings are displayed here at a glance. This section shows details about the content of the page, such as readability, top keywords, title, description and gives a Google preview. This is especially useful for blog or magazine articles. This category contains all technical aspects of the URL - here you can see for example if the robots.txt allows crawling of this URL, if it is included in the sitemap.xml, as well as details about the security and performance of the analyzed website. 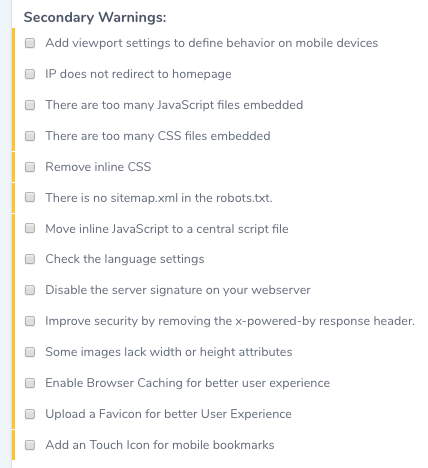 all information regarding mobile optimization is displayed here, such as the use of flash or variant response headers, to ensure the best usability for mobile use. This section shows a preview of what the URL would look like if it were shared on Facebook or Twitter. To start the analysis, navigate to Website Success from the Dashboard. There you will immediately find the input field for the URL of your landing page. Enter the desired URL and then click on the blue button "Single page analysis". Alternatively, you can select the "Single Page Analysis" report from the menu and also access analyses already performed, the results of which you can call up again. In the next step, you can optionally select the target country, the target language and the bot that crawls your site. In the upper part of the analysis, the central results are summarized graphically. In this example you will learn that the URL is accessible (status code 200 OK) and indexable. These are already good conditions. However, four problems and 16 warnings are also displayed. The OPQ has a value of 38 out of 100 possible points. There is therefore a need for action. Then, the errors on your landing page will be listed according to their severity. It is recommended to process them in descending order. By clicking on the respective aspect you are taken directly to the details. We are now working through all the points that our analysis has revealed. The description can be used for the snippet in the SERPs. A good meta-description can significantly increase the CTR in the SERPs. Solution: Create a click-strong meta-description. Tips can be found in this article. SSL encryption of a website is relevant for ranking and this will become even more important in the future. Find more information about this here. Solution: Get an SSL certificate and redirect your URLs to the https version. Here you will find a step-by-step guide to the SSL certificate. The analysis found an error between the language of the document and the meta element. This gives Google unclear information about the language used and may cause problems with different country versions of your website. Solution: Adjust the data so that it is congruent. Clicking on the link in the error message displays all problems with the W3C validator. An accumulation of these problems can lead to crawling and indexing problems by Google. Solution: Take a look at the individual list of possible errors. Usually you have to intervene in the source code or templates to fix the problem. In the next section you can take care of any warnings. Shorten title: If a page title is too long, Google will automatically shorten it for the snippet in the SERPs. If the title is too long, you should shorten it to a maximum of 70 characters. Make sure that the central keyword of the target page is included. Add your sitemap.xml URL to the Robots.txt: If you are already using an XML Sitemap, the URL to the Sitemap should be available in the Robots.txt so that the Googlebot can retrieve the listing of URLs there before crawling. Create and save favicon: The favicon is a small image graphic that is displayed in the browser tab or when saving bookmarks. It makes it easier to recognize your site. On the net you can find many free Favicon generators like this one here. This includes various entries such as the server signature. The tool shows you these elements. Since optimization for mobile devices is now relevant for rankings, you should always check for errors here. In our example, the tool provides information about errors with the viewport. For example, users of the target page who can access the URL on their smartphone may need to scroll to read the page. What are the next steps after the single page audit? After finding and deriving measures, you should solve your problems. Afterwards the same URL should be checked again with Ryte. The OPQ should then have increased and the number of warnings detected should have decreased. If you performed the single page audit due to ranking losses, you should check after a few weeks whether the rankings have "recovered" in the meantime. You can use Ryte Search Success for this, where you can track ranking changes with real Google data. In addition to single page analysis, it is also important to check your content. Ryte Content Success can help you. If you implement a TF*IDF analysis of the landing pag, the tool shows you where you can improve your texts by determining thematically relevant terms. Tip: Single page analysis is a great way to quickly get detailed information about a single URL. You can also use this feature to test the competition, for example - just enter your competitor's URL and get valuable insights into their website. There are many different reasons for a single page audit. It is important that you try to solve all existing problems promptly, depending on their severity. The tool shows you all relevant OnPage factors in real time but you should of course continuously check rankings and content in order to identify and use further optimization potential. Published on 04/24/2018 by Eva Wagner.